Renntech has made a career out of building programs for Mercedes models. Over the years, the German tuner has produced a handful of kits for a number of Mercedes models. A few on this hit list includes the CLS 63 AMG, E 55 AMG, C 63 AMG, and lest I forget, the SLS AMG. 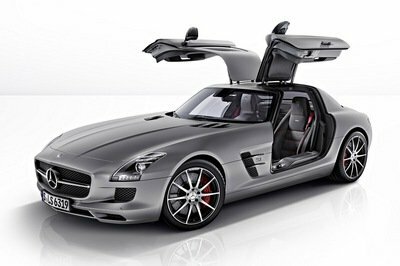 Now, Renntech has set its sights on the SLS AMG Black Series, the SLS AMG’s lighter and more powerful alter ego. Back when it was released in 2013, the SLS AMG Black Series represented the pinnacle of the SLS AMG production line. It was 154 pounds lighter than the standard SLS AMG and just as important, it packed a 6.3-liter V-8 engine that produced a whopping 622 horsepower and 468 pound-feet of torque, 31 more ponies than the last iteration of the SLS AMG. The impactful combination of being lighter and more powerful meant that the SLS AMG Black Series was capable of sprinting from 0 to 62 mph in just 3.5 seconds, two-tenths of a second faster than the regular model to go with a top speed of 196 mph. Obviously, the SLS AMG Black Series is already a whopper in it of itself. 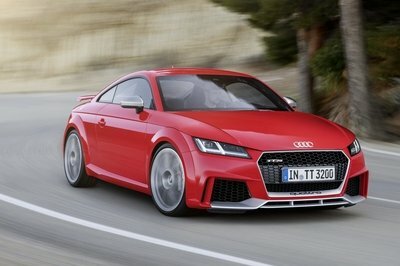 But, like any self-respecting auto tuner, Renntech wants to get more out of the supercar. 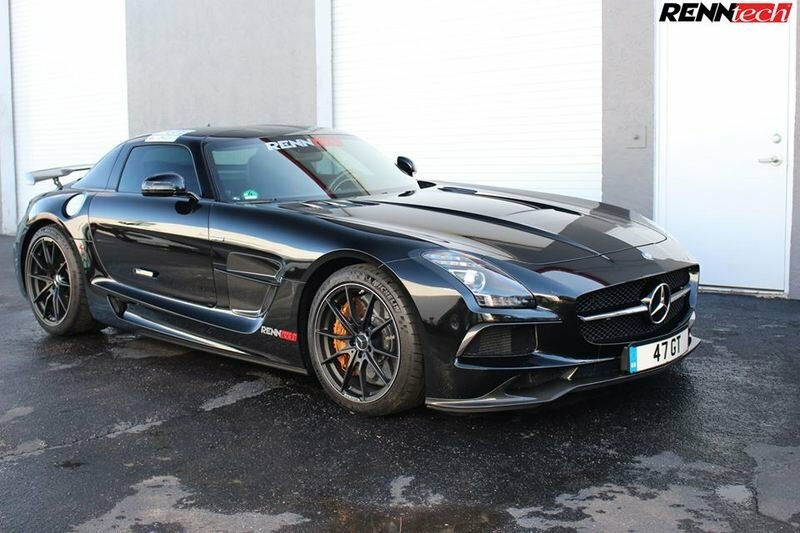 That pursuit eventually led to this: a heavily modified SLS AMG Black Series that can give even today’s supercars a serious run for their money. Yes, I’m talking about the Ferrari 488 GTB, the McLaren 650S, and the Lamborghini Huracan. The SLS AMG Black Series may have the years on the current lot of exotics, but with Renntech’s package in tow, it has the capability to be just as quick, and maybe even quicker. Continue reading to learn more about the Mercedes-Benz SLS AMG Black Series By RENNtech. The exterior upgrades are really minimal and at first glance, the SLS AMG Black Series’ only differentiation are the Renntech decals and badges scattered throughout the body. Upon closer inspection, some aero components on the car appear to have been upgraded. The front lip spoiler looks to be different, as is the rear wing, which incidentally has the aforementioned Renntech decals. The wheels also look to be aftermarket, although Renntech hasn’t said whether it’s offering wheel options for this particular program. This is the trickiest one to observe because Renntech didn’t mention any interior modifications and there are no photos of the cabin to assume that there are. So for now, I think it’s best to say that the SLS AMG Black Series’ cabin was kept in standard configuration. That’s not all that surprising considering that Renntech’s bread and butter is engine modifications. So as it is, don’t expect to see any cabin upgrades for this program. 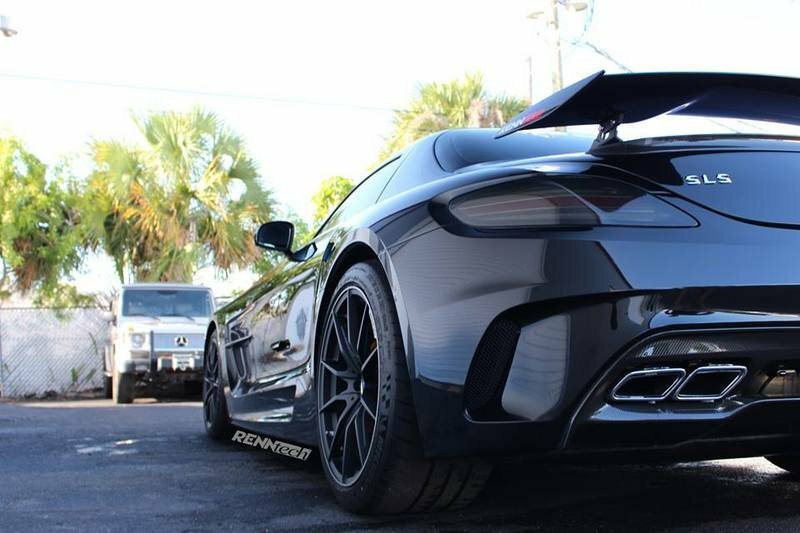 True to Renntech’s reputation, its engine program for the SLS AMG Black Series only consists of an ECU upgrade, stainless steel tube headers, and a performance air filter. As simple as it sounds, the results are still pretty impressive considering that the German tuner was able to coax 657 horsepower and 490 pound-feet of torque out of the supercar’s 6.3-liter V-8 engine. That’s almost 30 ponies and a little more than 20 pound-feet of torque more than the standard version. That extra power should be enough to propel the SLS AMG Black Series from 0 to 62 mph in the lower end of three seconds to go with a top speed that could hit 198 mph. Impressive as those numbers are, Renntech is also offering an R1 Performance Package that includes the aforementioned ECU remap and the new long tube header. This program adds 44 horsepower and 32 pound-feet of torque to the V-8 engine, bringing the total up to an impressive 675 horsepower and 500 pound-feet of torque. Make the car run a 0-to-62-mph sprint and the SLS AMG Black Series could cover that ground in three seconds while also hitting a top speed that could eclipse 200 mph. Customers who avail of Renntech’s ECU upgrade will be charged $3,495, excluding tax while those who may want to step up to the R1 Performance Package should expect to part ways with $11,450, also excluding tax. As for the BMC Performance Air Filter, Renntech’s charging $269 for that part. Let’s lay the ground rules here first. This program is (relatively) new given the car it’s for. With that in mind, I think it’s safe to line the Renntech-tuned SLS AMG Black Series against the current crop of supercars, including the Ferrari 488 GTB and the Lamborghini Huracan. Let’s start with the 488 GTB since there has been an influx of new tuning programs for Maranello’s finest. Wheelsandmore’s Settecento-Trenta kit is the most recent of these programs and it’s also the one that’s close to the neighborhood of Renntech’s program for the SLS AMG Black Series. Just like Renntech, Wheelsandmore’s kit isn’t about styles as much as it is about substance. If you look at the kit, there’s not a whole lot going on in the exterior and interior of the car. 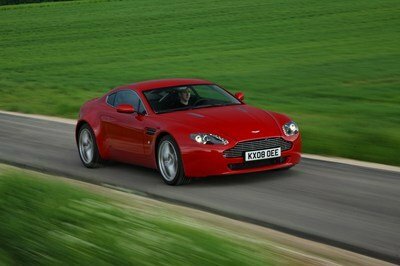 The only exception are the wheels, which is one of Wheelsandmore’s expertise, hence it’s name. The other notable aspect about this program is the engine upgrade, which actually comes in two stages. The first stage is made up of an ECU upgrade and new air filters. Together, these additions help bring the 488 GTB’s output up to 720 horsepower and 620 pound-feet of torque to play with. Then there’s the Stage II performance kit, which adds an F1-sourced air filter and an exhaust valve control to the ECU remap and the air filters. 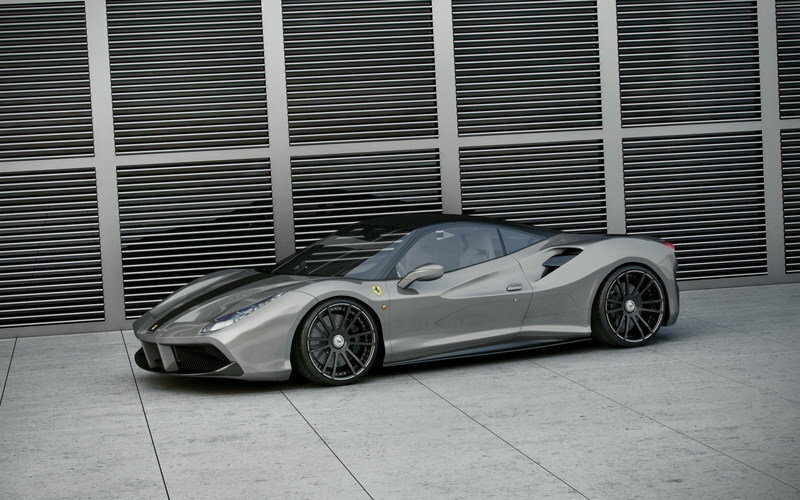 All together, they help the 488 GTB raise its output up to 730 horsepower and 627 pound-feet of torque. Wheelsandmore is also planning a third stage kit for the 488 GTB. With all the aforementioned parts already included, the German tuner will be adding a new manifold kit exclusively for the 488 GTB. No mention has been made on how many horses that’s going to add, but expect it to be more than the 730 ponies from the Stage II kit. Let’s stick to Wheelsandmore since the tuner already has a separate program for the Lamborghini Huracan. 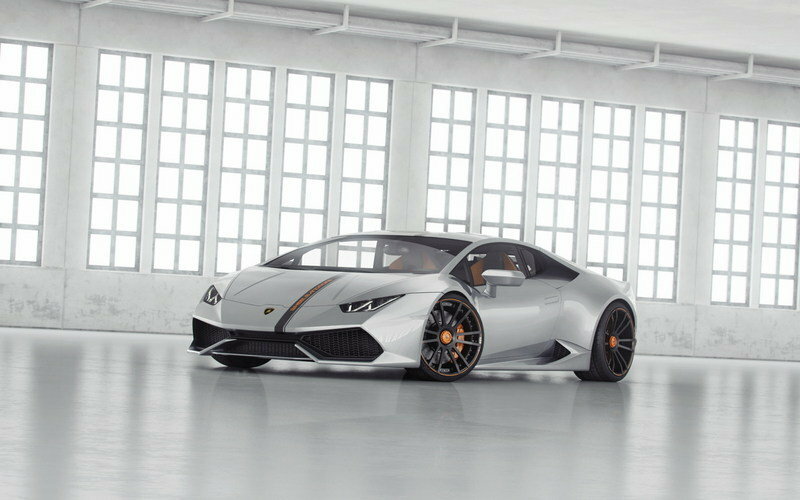 In keeping with its tradition of letting loose with its supercar engine mods, the German Tuner also prepared three separate power upgrades for Lamborghini’s successor to the almighty Gallardo. The first stage kit doesn’t really do much other than add a carbon-frame air filter and a hand-made, stainless steel exhaust system. These additions help propel the supercar’s output to 640 horsepower, 30 more than the standard output. If customers are looking for a really significant power bump, the second stage kit, with its compressor kit with a reinforced clutch and differential lock, helps bring the output up to 777 horsepower. Finally, there’s the third stage kit, which adds an ECU remap to boost the output up to an impressive 850 horsepower, head and shoulders more than what Renntech could do with the SLS AMG Black Series. It’s easy to be tempted by the allure of owning today’s crop of exotics. I mean, there’s really no wrong choice when you’re picking from a list that includes the 488 GTB, the Huracan, and the McLaren 650S. 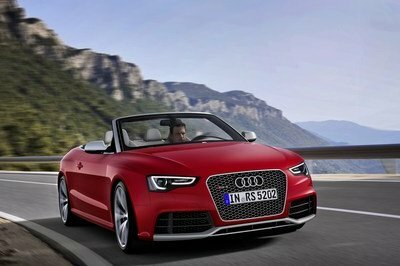 You can even throw in the Porsche 911 Turbo S and the Audi R8 V10 Plus into the mix. That or you can still opt for the Mercedes SLS AMG Black Series, if there are still any that’s available. 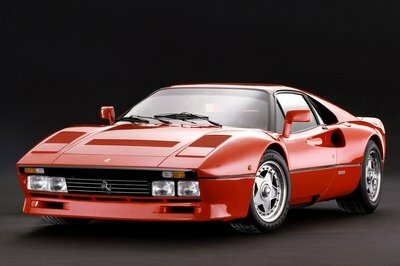 As attractive as those supercars are, nothing can replace the feeling of owning a model that’s already considered a modern-day classic. That’s the rare air that the SLS AMG Black Series currently occupies. It may be older, but its appeal has endured, and will likely continue to as the years go by. Having a tuner like Renntech offer a program for the SLS AMG Black Series is the cherry on top of the sundae.